12 J None No Power Seat 12 J is a standard Club World seat whose proximity to the galleys may be bothersome. 12 K None No Power Seat 12 K is a standard Club World seat whose proximity to the galleys may be bothersome. 13 A None No Power Seat 13 A is a standard Club World seat. 13 B None No Power Seat 13 B is a standard Club World seat whose proximity to the lavatories may be bothersome. 13 D None No Power Seat 13 D is a standard Club World seat whose proximity to the lavatories may be bothersome. 13 E None No Power Seat 13 E is a standard Club World seat. 13 F None No Power Seat 13 F is a standard Club World seat. 13 G None No Power Seat 13 G is a standard Club World seat whose proximity to the galleys may be bothersome. 13 J None No Power Seat 13 J is a standard Club World seat. 13 K None No Power Seat 13 K is a standard Club World seat. 14 A None No Power Seat 14 A is a standard Club World seat. 14 B None No Power Seat 14 B is a standard Club World seat whose proximity to the lavatory and galley may be bothersome. 14 D None No Power Seat 14 D is a standard Club World seat whose proximity to the lavatory and galley may be bothersome. 14 E None No Power Seat 14 E is a standard Club World seat. 14 F None No Power Seat 14 F is a standard Club World seat. 14 G None No Power Seat 14 G is a standard Club World seat whose proximity to the galley may be bothersome. 14 J None No Power Seat 14 J is a standard Club World seat whose proximity to the galley may be bothersome. 14 K None No Power Seat 14 K is a standard Club World seat. 17 A None No Power Seat 17 A is a standard Club World seat whose proximity to the lavatory and galley may be bothersome. 17 B None No Power Seat 17 B is a standard Club World seat whose proximity to the lavatory and galley may be bothersome. 17 D None No Power Seat 17 D is a standard Club World seat whose proximity to the lavatory and galley may be bothersome. 17 E None No Power Seat 17 E is a standard Club World seat whose proximity to the lavatory and galley may be bothersome. 17 F None No Power Seat 17 F is a standard Club World seat whose proximity to the lavatory and galley may be bothersome. 17 G None No Power Seat 17 G is a standard Club World seat whose proximity to the lavatory and galley may be bothersome. 17 J None No Power Seat 17 J is a standard Club World seat whose proximity to the lavatory and galley may be bothersome. 17 K None No Power Seat 17 K is a standard Club World seat whose proximity to the lavatory and galley may be bothersome. 18 A None No Power Seat 18 A is a standard Club World seat. 18 B None No Power Seat 18 B is a standard Club World seat. 18 D None No Power Seat 18 D is a standard Club World seat. 18 E None No Power Seat 18 E is a standard Club World seat. 18 F None No Power Seat 18 F is a standard Club World seat. 18 G None No Power Seat 18 G is a standard Club World seat. 18 J None No Power Seat 18 J is a standard Club World seat. 18 K None No Power Seat 18 K is a standard Club World seat. 19 A None No Power Seat 19 A is a standard Club World seat. 19 B None No Power Seat 19 B is a standard Club World seat. 19 D None No Power Seat 19 D is a standard Club World seat. 19 E None No Power Seat 19 E is a standard Club World seat. 19 F None No Power Seat 19 F is a standard Club World seat. 19 G None No Power Seat 19 G is a standard Club World seat. 19 J None No Power Seat 19 J is a standard Club World seat. 19 K None No Power Seat 19 K is a standard Club World seat. 20 A None No Power Seat 20 A is a standard Club World seat. 20 B None No Power Seat 20 B is a standard Club World seat. 20 D None No Power Seat 20 D is a standard Club World seat. 20 E None No Power Seat 20 E is a standard Club World seat. 20 F None No Power Seat 20 F is a standard Club World seat. 20 G None No Power Seat 20 G is a standard Club World seat. 20 J None No Power Seat 20 J is a standard Club World seat. 20 K None No Power Seat 20 K is a standard Club World seat. 21 A None No Power Seat 21 A is a standard Club World seat. 21 B None No Power Seat 21 B is a standard Club World seat. 21 D None No Power Seat 21 D is a standard Club World seat. 21 E None No Power Seat 21 E is a standard Club World seat. 21 F None No Power Seat 21 F is a standard Club World seat. 21 G None No Power Seat 21 G is a standard Club World seat. 21 J None No Power Seat 21 J is a standard Club World seat. 21 K None No Power Seat 21 K is a standard Club World seat. 22 A None No Power Seat 22 A is a standard Club World seat. 22 B None No Power Seat 22 B is a standard Club World seat. 22 D None No Power Seat 22 D is a standard Club World seat. 22 E None No Power Seat 22 E is a standard Club World seat. 22 F None No Power Seat 22 F is a standard Club World seat. 22 G None No Power Seat 22 G is a standard Club World seat. 22 J None No Power Seat 22 J is a standard Club World seat. 22 K None No Power Seat 22 K is a standard Club World seat. 33 A None No Power Seat 33 A is a standard World Traveller Plus seat that has extra legroom due to the position of the bulkhead. 33 B None No Power Seat 33 B is a standard World Traveller Plus seat that has extra legroom due to the position of the bulkhead. 33 D None No Power Seat 33 D is a standard World Traveller Plus seat that has extra legroom due to the position of the bulkhead. 33 E None No Power Seat 33 E is a standard World Traveller Plus seat that has extra legroom due to the position of the bulkhead. 33 F None No Power Seat 33 F is a standard World Traveller Plus seat that has extra legroom due to the position of the bulkhead. 33 G None No Power Seat 33 G is a standard World Traveller Plus seat that has extra legroom due to the position of the bulkhead. 33 J None No Power Seat 33 J is a standard World Traveller Plus seat that has extra legroom due to the position of the bulkhead. 33 K None No Power Seat 33 K is a standard World Traveller Plus seat that has extra legroom due to the position of the bulkhead. 34 A None No Power Seat 34 A is a standard World Traveller Plus seat. 34 B None No Power Seat 34 B is a standard World Traveller Plus seat. 34 D None No Power Seat 34 D is a standard World Traveller Plus seat. 34 E None No Power Seat 34 E is a standard World Traveller Plus seat. 34 F None No Power Seat 34 F is a standard World Traveller Plus seat. 34 G None No Power Seat 34 G is a standard World Traveller Plus seat. 34 J None No Power Seat 34 J is a standard World Traveller Plus seat. 34 K None No Power Seat 34 K is a standard World Traveller Plus seat. 35 A None No Power Seat 35 A is a standard World Traveller Plus seat. 35 B None No Power Seat 35 B is a standard World Traveller Plus seat. 35 D None No Power Seat 35 D is a standard World Traveller Plus seat. 35 E None No Power Seat 35 E is a standard World Traveller Plus seat. 35 F None No Power Seat 35 F is a standard World Traveller Plus seat. 35 G None No Power Seat 35 G is a standard World Traveller Plus seat. 35 J None No Power Seat 35 J is a standard World Traveller Plus seat whose proximity to the lavatory and galley may be bothersome. 35 K None No Power Seat 35 K is a standard World Traveller Plus seat whose proximity to the lavatory and galley may be bothersome. 36 A None No Power Seat 36 A is a standard World Traveller Plus seat whose proximity to the galley may be bothersome. 36 B None No Power Seat 36 B is a standard World Traveller Plus seat whose proximity to the galley may be bothersome. 36 D None No Power Seat 36 D is a standard World Traveller Plus seat whose proximity to the galley may be bothersome. 36 E None No Power Seat 36 E is a standard World Traveller Plus seat whose proximity to the galley may be bothersome. 36 F None No Power Seat 36 F is a standard World Traveller Plus seat whose proximity to the galley may be bothersome. 36 G None No Power Seat 36 G is a standard World Traveller Plus seat whose proximity to the lavatory and galley may be bothersome. 39 H None No Power Seat 39 H is a standard World Traveller seat that has extra legroom however, the proximity to the galleys may be bothersome. 39 J None No Power Seat 39 J is a standard World Traveller seat that has extra legroom however, the proximity to the galleys may be bothersome. 39 K None No Power Seat 39 K is a standard World Traveller seat that has extra legroom however, the proximity to the galleys may be bothersome. 40 A None No Power Seat 40 A is a standard World Traveller seat that has extra legroom. 40 B None No Power Seat 40 B is a standard World Traveller seat that has extra legroom. 40 C None No Power Seat 40 C is a standard World Traveller seat that has extra legroom however, the proximity to the galleys may be bothersome. 40 D None No Power Seat 40 D is a standard World Traveller seat that has extra legroom however, the proximity to the galleys may be bothersome. 40 E None No Power Seat 40 E is a standard World Traveller seat that has extra legroom however, the proximity to the galleys may be bothersome. 40 F None No Power Seat 40 F is a standard World Traveller seat that has extra legroom however, the proximity to the galleys may be bothersome. 40 G None No Power Seat 40 G is a standard World Traveller seat that has extra legroom however, the proximity to the galleys may be bothersome. 41 A None No Power Seat 41 A is a standard World Traveller seat. 41 G None No Power Seat 41 G is a standard World Traveller seat. 41 K None No Power Seat 41 K is a standard World Traveller seat. 42 G None No Power Seat 42 G is a standard World Traveller seat. 43 A None No Power Seat 43 A is a standard World Traveller seat. 43 B None No Power Seat 43 B is a standard World Traveller seat. 43 C None No Power Seat 43 C is a standard World Traveller seat. 43 G None No Power Seat 43 G is a standard World Traveller seat. 43 H None No Power Seat 43 H is a standard World Traveller seat. 43 J None No Power Seat 43 J is a standard World Traveller seat. 43 K None No Power Seat 43 K is a standard World Traveller seat. 44 A None No Power Seat 44 A is a standard World Traveller seat. 44 B None No Power Seat 44 B is a standard World Traveller seat. 44 C None No Power Seat 44 C is a standard World Traveller seat. 44 D None No Power Seat 44 D is a standard World Traveller seat. 44 E None No Power Seat 44 E is a standard World Traveller seat. 44 F None No Power Seat 44 F is a standard World Traveller seat. 44 G None No Power Seat 44 G is a standard World Traveller seat. 44 H None No Power Seat 44 H is a standard World Traveller seat. 44 J None No Power Seat 44 J is a standard World Traveller seat. 44 K None No Power Seat 44 K is a standard World Traveller seat. 45 A None No Power Seat 45 A is a standard World Traveller seat. 45 B None No Power Seat 45 B is a standard World Traveller seat. 45 C None No Power Seat 45 C is a standard World Traveller seat. 45 D None No Power Seat 45 D is a standard World Traveller seat. 45 E None No Power Seat 45 E is a standard World Traveller seat. 45 F None No Power Seat 45 F is a standard World Traveller seat. 45 G None No Power Seat 45 G is a standard World Traveller seat. 45 H None No Power Seat 45 H is a standard World Traveller seat. 45 J None No Power Seat 45 J is a standard World Traveller seat. 45 K None No Power Seat 45 K is a standard World Traveller seat. 46 A None No Power Seat 46 A is a standard World Traveller seat. 46 B None No Power Seat 46 B is a standard World Traveller seat. 46 C None No Power Seat 46 C is a standard World Traveller seat. 46 D None No Power Seat 46 D is a standard World Traveller seat. 46 E None No Power Seat 46 E is a standard World Traveller seat. 46 F None No Power Seat 46 F is a standard World Traveller seat. 46 G None No Power Seat 46 G is a standard World Traveller seat. 46 H None No Power Seat 46 H is a standard World Traveller seat. 46 J None No Power Seat 46 J is a standard World Traveller seat. 46 K None No Power Seat 46 K is a standard World Traveller seat. 47 A None No Power Seat 47 A is a standard World Traveller seat. 47 B None No Power Seat 47 B is a standard World Traveller seat. 47 C None No Power Seat 47 C is a standard World Traveller seat. 47 D None No Power Seat 47 D is a standard World Traveller seat. 47 E None No Power Seat 47 E is a standard World Traveller seat. 47 F None No Power Seat 47 F is a standard World Traveller seat. 47 G None No Power Seat 47 G is a standard World Traveller seat. 47 H None No Power Seat 47 H is a standard World Traveller seat. 47 J None No Power Seat 47 J is a standard World Traveller seat. 47 K None No Power Seat 47 K is a standard World Traveller seat. 48 A None No Power Seat 48 A is a standard World Traveller seat. 48 B None No Power Seat 48 B is a standard World Traveller seat. 48 C None No Power Seat 48 C is a standard World Traveller seat. 48 D None No Power Seat 48 D is a standard World Traveller seat. 48 E None No Power Seat 48 E is a standard World Traveller seat. 48 F None No Power Seat 48 F is a standard World Traveller seat. 48 G None No Power Seat 48 G is a standard World Traveller seat. 48 H None No Power Seat 48 H is a standard World Traveller seat. 48 J None No Power Seat 48 J is a standard World Traveller seat. 48 K None No Power Seat 48 K is a standard World Traveller seat. 49 A None No Power Seat 49 A is a standard World Traveller seat. 49 B None No Power Seat 49 B is a standard World Traveller seat. 49 C None No Power Seat 49 C is a standard World Traveller seat. 49 D None No Power Seat 49 D is a standard World Traveller seat. 49 E None No Power Seat 49 E is a standard World Traveller seat. 49 F None No Power Seat 49 F is a standard World Traveller seat. 49 G None No Power Seat 49 G is a standard World Traveller seat. 49 H None No Power Seat 49 H is a standard World Traveller seat. 49 J None No Power Seat 49 J is a standard World Traveller seat. 49 K None No Power Seat 49 K is a standard World Traveller seat. 5 A None No Power Seat 5 A is a standard First class seat whose proximity to the lavatories and galleys may be bothersome. 5 E None No Power Seat 5 E is a standard First class seat whose proximity to the lavatories and galleys may be bothersome. 5 F None No Power Seat 5 F is a standard First class seat whose proximity to the lavatories and galleys may be bothersome. 5 K None No Power Seat 5 K is a standard First class seat whose proximity to the lavatories and galleys may be bothersome. 50 A None No Power Seat 50 A is a standard World Traveller seat. 50 B None No Power Seat 50 B is a standard World Traveller seat. 50 C None No Power Seat 50 C is a standard World Traveller seat. 50 D None No Power Seat 50 D is a standard World Traveller seat. 50 E None No Power Seat 50 E is a standard World Traveller seat. 50 F None No Power Seat 50 F is a standard World Traveller seat. 50 G None No Power Seat 50 G is a standard World Traveller seat. 50 H None No Power Seat 50 H is a standard World Traveller seat. 50 J None No Power Seat 50 J is a standard World Traveller seat. 50 K None No Power Seat 50 K is a standard World Traveller seat. 51 B None No Power Seat 51 B is a standard World Traveller seat. 51 C None No Power Seat 51 C is a standard World Traveller seat. 51 D None No Power Seat 51 D is a standard World Traveller seat. 51 E None No Power Seat 51 E is a standard World Traveller seat. 51 F None No Power Seat 51 F is a standard World Traveller seat. 51 G None No Power Seat 51 G is a standard World Traveller seat. 51 H None No Power Seat 51 H is a standard World Traveller seat. 51 J None No Power Seat 51 J is a standard World Traveller seat. 52 B None No Power Seat 52 B is a standard World Traveller seat. 52 C None No Power Seat 52 C is a standard World Traveller seat. 52 D None No Power Seat 52 D is a standard World Traveller seat. 52 E None No Power Seat 52 E is a standard World Traveller seat. 52 F None No Power Seat 52 F is a standard World Traveller seat. 52 G None No Power Seat 52 G is a standard World Traveller seat. 52 H None No Power Seat 52 H is a standard World Traveller seat. 52 J None No Power Seat 52 J is a standard World Traveller seat. 53 B None No Power Seat 53 B is a standard World Traveller seat in the last row of this aircraft and may have limited recline. The proximity to the lavatories may be bothersome. 53 C None No Power Seat 53 C is a standard World Traveller seat in the last row of this aircraft and may have limited recline. The proximity to the lavatories may be bothersome. 53 D None No Power Seat 53 D is a standard World Traveller seat. 53 E None No Power Seat 53 E is a standard World Traveller seat. 53 F None No Power Seat 53 F is a standard World Traveller seat. 53 G None No Power Seat 53 G is a standard World Traveller seat. 53 H None No Power Seat 53 H is a standard World Traveller seat in the last row of this aircraft and may have limited recline. The proximity to the lavatories may be bothersome. 53 J None No Power Seat 53 J is a standard World Traveller seat in the last row of this aircraft and may have limited recline. The proximity to the lavatories may be bothersome. 54 D None No Power Seat 54 D is a standard World Traveller seat whose proximity to the lavatories may be bothersome. 54 E None No Power Seat 54 E is a standard World Traveller seat. 54 F None No Power Seat 54 F is a standard World Traveller seat. 54 G None No Power Seat 54 G is a standard World Traveller seat whose proximity to the lavatories may be bothersome. 55 D None No Power Seat 55 D is a standard World Traveller seat in the last row of this aircraft and may have limited recline. The proximity to the lavatories may be bothersome. 55 E None No Power Seat 55 E is a standard World Traveller seat in the last row of this aircraft and may have limited recline. The proximity to the lavatories may be bothersome. 55 F None No Power Seat 55 F is a standard World Traveller seat in the last row of this aircraft and may have limited recline. The proximity to the lavatories may be bothersome. 55 G None No Power Seat 55 G is a standard World Traveller seat in the last row of this aircraft and may have limited recline. The proximity to the lavatories may be bothersome. 60 A None No Power Seat 60 A is a standard Club World seat. 60 B None No Power Seat 60 B is a standard Club World seat whose proximity to the lavatory may be bothersome. 60 J None No Power Seat 60 J is a standard Club World seat whose proximity to the lavatory may be bothersome. 60 K None No Power Seat 60 K is a standard Club World seat. 61 A None No Power Seat 61 A is a standard Club World seat. 61 B None No Power Seat 61 B is a standard Club World seat. 61 J None No Power Seat 61 J is a standard Club World seat. 61 K None No Power Seat 61 K is a standard Club World seat. 62 A None No Power Seat 62 A is a standard Club World seat. 62 B None No Power Seat 62 B is a standard Club World seat. 62 J None No Power Seat 62 J is a standard Club World seat. 62 K None No Power Seat 62 K is a standard Club World seat. 63 A None No Power Seat 63 A is a standard Club World seat. 63 B None No Power Seat 63 B is a standard Club World seat. 63 J None No Power Seat 63 J is a standard Club World seat. 63 K None No Power Seat 63 K is a standard Club World seat. 64 A None No Power Seat 64 A is a standard Club World seat. 64 B None No Power Seat 64 B is a standard Club World seat whose proximity to the lavatory may be bothersome. 64 J None No Power Seat 64 J is a standard Club World seat whose proximity to the lavatory may be bothersome. 64 K None No Power Seat 64 K is a standard Club World seat whose proximity to the lavatory may be bothersome. British Airways now offers audio and video onDemand on all its 747s. First, Club World Business, and World Traveller Plus all feature in-seat AC power connections which accept UK, US, and European plugs. There are no power ports in the standard World Traveller class. There have been reports of EmPower ports rather than AC power on some aircraft. There are 4 classes of service on this version of the BA's 747, it features 14 flat bed First Class seats, 86 flat bed Business Class seats, 30 Premium Economy seats, and 145 standard Economy seats. The Club World window seats on the upper deck have extra space between the seat and the window that can be used for storage. I was skeptical of flying on the older 747 after flying the A380 to and from Johannesburg from London. Though I like the quiet of the A380, I must say that the refurbished interior of the 747 and intimacy of the smaller WTPlus cabin was a pleasant surprise. On my flight from LHR to SFO I was greeted with a generous pour(compared to WTP on A380) of sparkling wine in a stem glass before takeoff. The curried chicken meal was of restaurant quality and the little extras like ice cream and sweets/salty between services was nice. Due to the location of the galley and the much smaller cabin, service was much quicker and the nearby galley area was a few steps away for a stretch and place to stand vs the A380. Though the map shows my seat 35J in yellow, there was hardly any noise from the lavatory. The cabin crew were particularly friendly and attentive to my requests. The new seats and video were great. I wouldn't hesitate to choose this aircraft even though the engine noise is louder. The noise cancelling headphones help with that. YIKES! Whoever reconfigured the business class seat arrangement on this plane should have been fired. They took a perfectly great 747 & added an extra seat (so 8 across) & then reversed half the seats to rear facing & enclosed each seat into a "pod". Seats are much narrower than standard 747. When seat divider screen is down you are looking directly into the face of passenger next to you. There is ZERO storage... no under the seat storage, no seat back storage, no magazine storage. A wee pull out drawer is only storage & it's full after storing your water bottle, business amenity bag & headphones. Tray table & TV screen are difficult to operate. NOTHING can be on floor during take off & landing (not even your blanket). SFO-LHR - this is easily the best economy cabin on this route. A refurbished, modern cabin with an excellent new Panasonic IFE system (that comes without the obsene footspace robbing equipment boxes that you get on BA's A380's and 777's that also fly this route). Recently flew SFO to LHR and had seat 35B in World Traveller Plus. The seat was a tight fit and I'm not big. I feel sorry for bigger people like the man next to me. I couldn't even get out the remote control without litterally moving out of the seat. The recliner, back support buttons didn't work properly. The servie on BA has become terrible. The food was bland and tastless. There is not such thing any more of coming around offering warm drinks in between. You only get water and OJ. I'm not convinced that paying double than an economy seat you really do get more for your money. SAN to LHR. First I completely disagree with the positive comments about the business class seats on this plane. The unbelievable lack of privacy of having someone facing you about 18 inches from your face is appalling. The seats have no storage space, even for head phones. Complicated buttons for opening tv and trays. 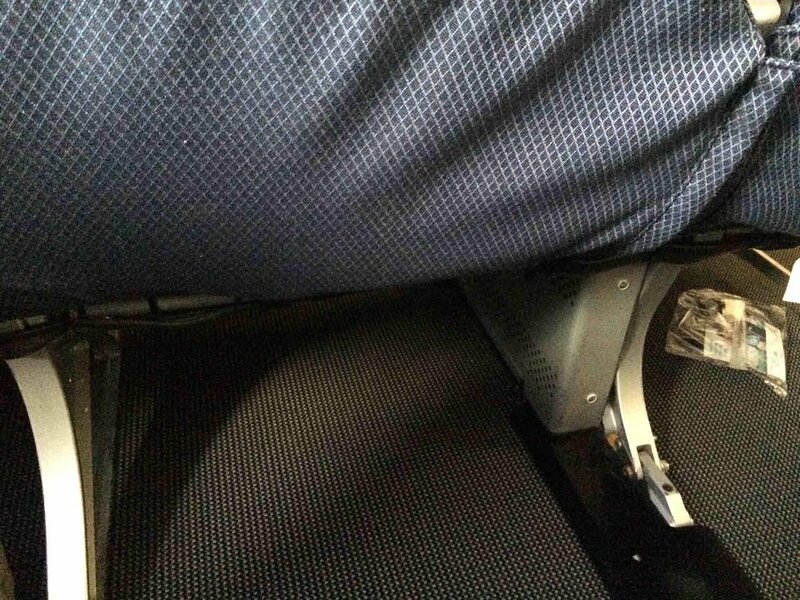 More important that the bizaar seat design was the complete lack of service in this part of the plane. All the service comes from a galley two section forward. The flight attendants never bother to come this far back in the section. For the 10 hour flight, I was offered one cocktail, one glass of wine, and one glass of water. Period. When I wanted another glass of wine with my meal, I had to go to galley and pour it myself, while the flight attendant stood chatting and amused. The only reason to choose this seat is if you want to go to sleep. Roomy and the IFE selection was generous. Although there is no A/C power port as Seatguru says, there is a USB port for charging your phone. I was rebooked from a LH flight to this BA flight (B747-4 V3)out of Seattle because of strike by ground staff of Frankfurt airport. Excellent seat and place in the aircraft. It reclines adequately and there are no worries about the proximity of the galley or lavatory. Food is below par compared to premium eco seats with other air lines. IFE is adequate, promptness of flight times exemplary. I slept like a baby. World Traveller Plus is not comfortable as an accesible Traveller. The armrests are not moveable. Seat 33 B is an alternative decission, as you can move from the wheelchair frontal to the seat. Comfort is quiet godd. Pretty good seat. Good amount of space, 2 windows and plenty of width. The only problem was that the tray table was a little difficult to open and close then the seat in front was fully reclined. The seat itself was not bad, if a little firm. One additional minor detail was that the remote for the IFE is stored in the armrest right by your leg so it was a little difficult to access and fairly easy to accidentally press a button if you weren't careful. Otherwise, the premium economy is well worth the upgrade if the price is right. Not a bad seat. Right at the front of the cabin so quick to be served and de-board. Also has two windows and a pretty good view out. Legroom was typical BA (not great). Pretty tight for me at 6'1" but pretty standard for economy. Excellent seats. No seats behind to disturb anyone and space behind to the lavatory. I didn't even realize the lavatory was there, and walked all the way to the back of the plane. No noise problems at all. There were some minor issues with the lighting and audio controls, but we managed. Eastbound we were in World Traveller (50-ish) and it was eh, OK. Westbound we were randomly upgraded to WT+. Much much better and obviously worth the price we paid. This is a fabulous world traveler plus seat and location. You can see out your two windows since tbe seat is just to the back of the wing. The seat reclines and since no one is behind you, you're not infringing anyone behind you. There's no noise from the lavatory behind you because you're not right up against tbe bulkhead. The food was delicious (chicken) and the service was the usual British service if not better. This would be my seat of choice the time i fly British. Well worth the upgrade fee offer for Extra leg room and width. Great added service touches: Bubbles pre-takeoff, warm towels, expanded menu. Electrical box under the seat in-front reduces leg room and storage space. By the look of the seats on the plane we flew on from LHR - BOS, we were in an overhauled version of Premium Economy on the 747. My husband is 6'4" and very happy with the leg room in seat 36D (aisle). I found the seat to be a good width and what I would expect in the Premium cabin - far better that the one in the 777 we flew back on that clearly hadn't been updated. The screen in the seat back in front was larger than you would get in economy, clear and responsive to touch controls. The food served was definitely edible but nothing out-of-this-world! Very good seat - once the seat divider is up, it's very private with the cabin divider to one end and the windows on the other. Great that you don't have to step over someone else's feet when they're sleeping to get out. I do not recall a comment on this seat, however, it looks to be the same configuration as our flight back from Dallas on 31 August. The seat was hard and cramped and a reclined seat in front made it even more so. There was also a lot of noise on take off that was disturbing. I note that US passengers seemed to pay far less for the upgrade than we did from the UK where our fare was almost doubled. The service and food were good but after having to switch to AA for out outbound flight on a 787 the contrast was striking, especially the lower noise level. Its a great seat with lost of storage but if the person in the row behind has their foot stool down its didficult to get to the aisle without knockibg them when stepping over. Bad seat donfiguration here. While it is close to the galley and washroom, the separating curtain cuts down noise and light perfectly (plus you always know when the washroom is free) Best of all, there's extra hanging space for a blazer between 17F and the bulkhead and there are no bassinet hook-ups (they're at the rear of the cabin so you're furthest away from babies) and you're served earlier for drinks and dinner. British Airways premium economy is terrible, save your money. The plane was an old 747 that looked and felt old. The seats were not comfortable and without a lot of legroom. We flew Lufthansa last year & their premium economy was worth the money. Also BA cancelled our LHR-PHL flight at the last minute without any reason. I would stay away from BA premium economy. Exit row seat - Window seat passenger will not be hopping over your legs as they have a small walkway to use. This seat is fantastic. Being near the lavatory is not bothersome at all, especially once you put the divider up. This seat, as well as 64A are the best seats on the upper deck. I sat in both seats on 2 separate legs from JFK-LHR-CPT. It feels like you are in your own suite and they are both very private. Both seats have aisle access as you do not have to climb over anyone to leave your seat. This seat is highlighted in yellow and marked as "be aware" due to its proximity to the galley. I recently sat here during my morning flight from JFK to London and enjoyed this seat very much. The flight crew did not spend a ton of time in the galley so proximity was not an issue. The seats were very comfortable and spacious. The plane itself was nicely updated and very clean. Service was friendly and promptplenty of beverages were served and the food was delicious. Definitely worth the upgrade over standard economy. A very good World traveller seat. Bulkhead position gives you a bit of extra legroom. Two windows available at this seat. Overnight to London from Chicago is around 7 hours or so and the 747 is naturally roomy although some are showing their age (particularly the example I took on the return flight) but BA have done a good job with their WT+ cabin. As much as I am a fan of SeatGuru there seems to be a default yellow rating for any seat near the toilets or galleys. 35K is such a seat but I disagree with the designation as, although it is next to the washroom, there is a wide gap between the back the seat and the wall of the toilet and it was never a problem on this flight. With only 30 seats the WT+ cabin feels exclusive and I would choose this seat again since the curve of the fuselage gives one a ton of space to the right of the seat, as well as ample under the seat in front. There is plenty of room here for a 5'10 person such as me. Well worth the premium (only $200 or so) over Econ in my opinion. The upgraded IFE is first class, crisp screen and ultra responsive. The food among the best I've ever had on a plane outside traveling up front.The 747 is still majestic and I would choose this flight across the pond, in this seat, anytime. I sat in this seat for a full ORD-LHR flight and found it very good. The seat reclined the normal amount and there was no one behind me to worry about. Width was standard and there was a slight gap between the seat and the window. This gave space to set your small bag next to you, leaving the area below the seat in front clear for your feet. Being a lefty I enjoyed having the extra space to move my arm/eat freely without having to worry about getting bumped in an aisle seat. People do tend to gather in the area behind you and there's a bit of gallery noise but there's a partition so no one bumped my seat. i flew London-Singapore-Sydney (back when BA did the trip with the 747, it was a great experience being in what felt like your own little cabin, very cosy and relaxing. DXB-LHR on 29th Jan 17 - Upper deck in the 747 has a distinctly different and quiet atmosphere and I would definitely recommend it, as long as you don't have problems carrying your luggage up the narrow steep stairs. Nobody stepping over you in this seat. A sleeper service so lights went out right away. Positive experience. Seats on this aircraft in the World Traveler Plus cabin have their tray tables located in the seat arm, reducing the width of the seat. SeatGuru does not mention this. Although the seat is still fairly comfortable, the width may be a problem for people with a larger frame. I am 6'4" tall and weigh 225 pounds. I filled up the seat such that I had to remove the IFE remote control in order to use it, as did my much smaller wife. This is the new refurbished 747 with am all new cabin interior. This has got to be the best WT cabin you will find on any BA aircraft. The new Panasonic IFE system is amazing, and doesn't come with the footspace robbing equipment box disaster that exists on the Thales equipped 777's, 787's and A380's. Truly well done BA. LHR to ORD. The lounge was very busy and I was unable to book a spa treatment despite arriving a little over three hours early. The lady at reception was somewhat condescending. 14K was very convenient as it was close to the door, club kitchen and toilets. As it was on the end I didnt have to climb over anyone to get out. Personally I would avoid 14J as its proximity to the closet was bothersome to the man who sat there. The Club kitchen was somewhat disappointing as it didn't have a number of items listed in the menu. The seat was comfortable although having the storage draw so low was problematic as it wasnt accessible once the seat was reclined. As you could access my seat without troubling anyone else I was surprised that the crew lowered the privacy screen and reached over 14J whenever they wanted to pass me anything. The man sitting there was not impressed. The IFE worked well, the selection was good but the headphones werent very impressive. A bit cramped but middle seat still offered good views out of the window. The new world traveller seats were pretty comfortable for an overnight flight, although under seat space was a bit restricted even without an entertainment box. Also if you're quite broad than you may find the seat a bit narrow. The new IFE is super easy to use and has a good offering to keep you amused. British Airways flies 3 versions of Boeing 747-400 52-Bus..